Daily Distractions: Revisiting Greg Maddux, on the eve of his Hall of Fame announcement. For your consideration, in the category of important dates in Dodgers history: June 6 and July 31, 2006. On June 6, the Dodgers drafted Clayton Kershaw out of high school. On July 31, they traded for Greg Maddux. Not a bad couple months. Maddux won’t be a unanimous first-ballot Hall of Fame selection, but he’ll probably come close. The Hall of Fame class of 2014 will be announced Wednesday and, barring a stunning comeback by Mike Piazza (currently polling at 67.7 percent), Maddux will be the only former Dodger going into Cooperstown this year. I talked to Dodgers president Stan Kasten about Maddux and his legacy. Kasten was president of the Atlanta Braves during Maddux’s prime, which included a run of four straight Cy Young Awards, three straight ERA titles, and no less than 15 wins every season from 1988 to 2004. Take a moment to soak all that in. Only one thing gave Kasten any pause about signing the pitcher to a five-year, $28 million deal. Maddux only went on the disabled list once in 23 seasons. Maybe he played through more pain than anyone realized. Daily Distractions: Important roster decisions coming. Who will the Dodgers cut? The Dodgers are in the market for a pair of infielders. Mark Ellis and Jerry Hairston Jr., currently on the disabled list with a strained right quadriceps and left groin, respectively, are expected to join the team at some point during this weekend’s road trip to Atlanta. Both are rehabbing tonight with the Double-A Chattanooga Lookouts. But to take each off the disabled list means that another player must come off the active roster, and the choices are not obvious. After all, who expected Elian Herrera to get the first call-up when Hairston went on the disabled list two weeks ago? – Luis Cruz. A gifted third baseman/shortstop, Cruz hasn’t hit enough this year to justify being on a major-league roster. In 69 at-bats, he has six singles for a .087 batting average and slugging percentage. Cruz is out of options, so the Dodgers would probably have to designate him for assignment. The prospect of closing the book on last year’s feel good story (and a player whose jerseys are still displayed prominently in the window of the Dodgers’ team store) has become a story in and of itself. – Ramon Hernandez. At 38, Hernandez’s bat speed isn’t what it used to be. 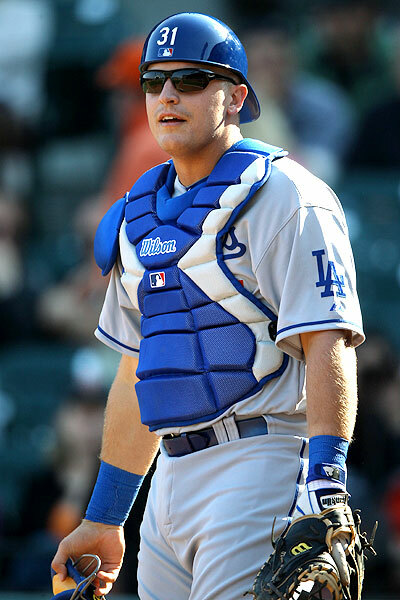 He’s batting even below the Cruz Line, at .045, and the Dodgers have two catchers ahead of him on the depth chart. The Dodgers have two first basemen ahead of him on the depth chart, too, in Adrian Gonzalez and Scott Van Slyke. Like Cruz, Hernandez would probably be designated for assignment since he’s been out of options since 2002. – Van Slyke. Sending Van Slyke out doesn’t make as much sense, given the Dodgers’ need for power and a backup first baseman/corner outfielder, but they’ve cut him loose before. In nine plate appearances, SVS has a single, a home run, two strikeouts and a walk. – Dee Gordon. Like Van Slyke, there are reasons to keep Gordon but history isn’t on his side. The Dodgers never wanted Gordon playing an everyday shortstop role in the majors until he was ready, and Gordon’s .220 batting average and negative UZR (which is actually up from last season) aren’t strong signs of readiness. The Dodgers could easily platoon Cruz, Nick Punto, Juan Uribe and Hairston on the left side of the infield until Hanley Ramirez returns from the disabled list. Dodgers recall Tim Federowicz and place Chris Capuano (calf) on the 15-day disabled list. Chris Capuano collided with Jason Marquis and fell down covering first base in the first inning. He wasn’t injured on that play, but stayed in the game and strained his left calf muscle running to cover the bag in the second. Chris Capuano was placed on the 15-day disabled list Wednesday, ruling him out for the next time the Dodgers will need a fifth starter. That spot wouldn’t necessarily come up until the Dodgers’ April 27 home game against the Milwuakee Brewers, but manger Don Mattingly said he would like to use the fifth starter on April 24 at Citi Field against the New York Mets to give Clayton Kershaw, Hyun-Jin Ryu, Chad Billingsley and Josh Beckett an extra day between their next two starts. 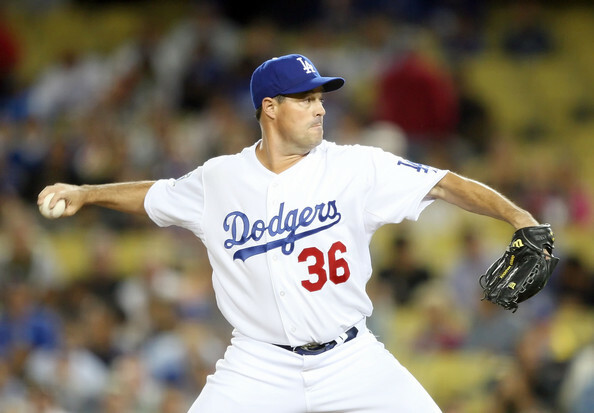 Ted Lilly returned to the team one day after making a rehab start for Single-A Rancho Cucamonga and is scheduled to throw a bullpen session in two days. He’s done making rehab starts and is poised to take the fifth turn in the rotation. Dodgers option Tim Federowicz to Triple-A Albuquerque. The Dodgers, carrying three catchers and needing to make room for right-hander Chad Billingsley, optioned backstop Tim Federowicz to Triple-A Albuquerque on Tuesday. Federowicz went 0-for-3 with a walk in his only appearance of the season Sunday. Federowicz hit .294 with 11 home runs and 76 RBIs in his first full Triple-A season last year. That was enough to earn a promotion to the relatively low-pressure job of a backup major-league catcher. He held the edge on the job from the end of last season to the end of spring training, until the Dodgers traded Aaron Harang for veteran catcher Ramon Hernandez on Saturday. Hernandez will back up starter A.J. Ellis. Billingsley is scheduled to start tomorrow against Padres left-hander Eric Stults in San Diego.